Abstract: The challenges we face today – ecological, social and political – demand new forms of consciousness, creativity and collective action. 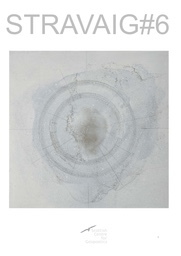 In his book The Radical Field (2007), Tony McManus outlines the world significance of geopoetics as a theory-practice for what he calls ‘radical cultural renewal.’ Inspired by his writings, Mairi will reflect on her own journey as an ethnologist and will trace the contours of an emerging praxis which finds grounds for radical hope in geopoetics. It is more necessary than ever that we gather together and continue to explore how to live on this earth in more hopeful, joyful and life-giving ways. Thank you to Norman Bissell and the Scottish Centre for Geopoetics for inviting me to give this lecture today. This event is also part of the Intercultural Research Centre’s Sustainable Communities Sustainable Heritage Festival, so I’d also like to thank Ullrich Kockel and Máiréad Nic Craith at the IRC for their continued support and encouragement, and to thank you all for coming along today. For Tony McManus, who we are here celebrating today, the study of geopoetics and living a creative life were inseparable, each enriching the other. He believed passionately that geopoetics, as a world theory-practice – as an approach to thinking and living – opens the way to creativity for everyone, and can create the possibility of experiencing and expressing the world in a livelier, more perceptive way. For him, geopoetics provides the hope and the basis for the radical cultural renewal we so badly need today. This will be a lecture in 2 parts. In the first, I will reflect on my own journey into geopoetics, exploring the potential of my own field of ethnology as an emerging creative practice. This is the topic of my essay in the Stravaig journal, so a more in-depth account of this is there if you are interested (also here). In many ways responding to a personal need to make some sense of the utter burach in which we have found ourselves, I will reflect on where we are now, how we got here, and where we might go next. I will introduce a map for navigating our way through, how we might ‘open a world,’ finding grounds for radical hope in geopoetics. What I am offering here are by no means answers, but rather a tentative interpretation and some unfinished thoughts from a personal perspective, searching for the right questions to ask. My own journey into geopoetics began a long time ago, although I did not realise it at the time. This was during my PhD research – a study of the traditional ballad, based at the School of Scottish Studies Archives. Rather than focusing on a collection of ballad ‘texts’, I was interested in the live embodied encounter of song performance: the shivers, tingles, and chills we sometimes experience listening to unaccompanied traditional song. Many of us will be able to bring to mind such an encounter – perhaps listening to live music, reading poetry or discovering visual art, being in nature, a religious experience, being part of a political movement. These are often the occasions that we become aware, if only fleetingly, that we are here, that we are together, that we are connected. Ethnologists might call this experience communitas. As a researcher, I am interested in these heightened moments that re-frame or affirm our perception of the world and our relationship to it. A ‘heightened aesthetic experience’ is understood here not in the sense of a matter of judgement or taste, but rather – as opposed to the anaesthetic experience – as one in which our senses are operating at their peak, when we are present in the current moment with heightened awareness, when we are and fully alive. Often, in order to make sense of our experiences, we reach for metaphor, for poetic language, to create and re-create meaning. Metaphor has poetic power precisely because it re-connects abstract thought with embodied experience, providing a grounding we often fail to see precisely because it is so pervasive and fundamental. The philosopher Mark Johnson (2007) makes the case that all metaphors are grounded in our visceral experience and explains that it is through our bodily perceptions, movements, senses and emotions that meaning becomes possible. That is to say, all aspects of meaning-making are fundamentally aesthetic. The central question, then, is this: what is the relationship between our embodied experience and perception, and the language we use to express it? I later came to realise that is a central question of geopoetics (McManus 2007). To find an answer, my own research turned to phenomenology – a research method that attends to the affective dimension of our embodied experience; and to hermeneutics – which is concerned with how we interpret and express our subjective lived experience in and through language as part of a process of meaning-making. In truth, I found the experience of academic research both thrilling and strangely alienating; alienating in the sense that, in such an intensely cerebral environment, I felt disconnected from my own body. I discovered that it is quite possible to grasp or comprehend a philosophical concept but not understand it, bodily. Theoretical explanations quickly become removed from lived reality and from the infinitely rich encounters that cause us to want to think more deeply about our experience in the first place. In geopoetics, I found a way to reconcile – or perhaps reconnect, in a way that made sense to me – the rigour of cerebral, analytic work with the experience of being a body in the world. For me, this is what geopoetics was first about: seeking awareness and understanding both intellectually, by developing knowledge, and sensitively, bodily, intuitively using all our senses to become ‘attuned to the world.’ I visualise geopoetics as the rigorous pursuit of clarity of thought, chasing those flashes of insight, creativity and connection, but always grounded in my embodied, aesthetic experience of being-in-the-world. I know most of you in the room will be familiar with geopoetics, but if you’ll let me, for those of you who are not, I’ll take a wee bit of time to outline some of the key ideas, as I interpret them. The difficulty here is is that geopoetics is not linear, and it is very difficult to find a thread through in such a short talk. Geopoetics begins, then, with a ‘radical critical analysis’ of the ‘cultural mindscape’ we find ourselves in today. Kenneth White begins by rejecting the philosophical stances which underpin what he calls the ‘Motorway of our Western civilisation’ and our modern culture. He looks for signs of those who have attempted to leave this motorway, searching for alternative ways of looking at the world, and celebrating the figure of the ‘intellectual nomad,’ the poet-thinker, the artist-philosopher. First, White rejects Plato’s idealism, which leads to the fundamental western belief that reality is to be found somewhere other than the here and now. He rejects Aristotle’s division of the world, and our experience of it, into separate categories. Their modern derivatives are similarly rejected – the dualism in Descartes’ separation of human from nature and mind from body; rationalism, which derives from this division of subject from object; and humanism, with its Hegelian notion of historical progress and its exploitative approach to nature. This leads White to what he calls the central debilitating problem in our culture: a failure to ‘see life whole.’ Our worldview, dominated by a mechanistic, rational science that privileges whatever can be numbered, measured and weighed, has given rise to the loss of ‘a sense of world.’ This loss is reflected in the reductionist and atomistic division of areas of knowledge into discrete categories. Geopoetics argues for the plural need to amend the excessive damage the environment, human consciousness, and being are experiencing as a consequence of this ‘loss of world.’ In search of alternatives, White engages with non-western traditions, and with traditions of European phenomenology – Husserl, Heidegger and others. Husserl’s Phenomenology and the Crisis of Philosophy (1936) criticises science’s objectivism as naivety and seeks to reinstate the thinking mind as one which can perceive reality as a whole. From this radical cultural analysis, White finds grounds for a renewal of culture. By this, he means a new cultural perspective whereby the various domains into which knowledge has been separated can be unified by a poetics, which places the planet Earth at the centre of experience. ‘The real work’ he writes, consists of ‘changing the categories, grounding a new anthropology, moving towards a new experience of the earth and of life’ (White 2004, 22). Like Merleau-Ponty’s phenomenological ‘radical reflection’ or Heidegger’s hermeneutic drive ‘to get back to the beginning of thought’, geopoetics requires an openness and readiness to both recognise and consciously abandon inherited concepts, philosophical assumptions and the cultural baggage of language, ideology and discourse. It is, in many ways, a process of radical unlearning. It is about decolonising the mind. A ‘new mental cartography’ White called it. A re-mapping of our relationship with the world. If geography means earth-writing, geopoetics can be interpreted as means world-making. It is fundamentally about creativity. McManus writes, ‘the word ‘poetry’ in this context does not refer to the current mass of more or less formulaic statements of personal-social angst which rarely goes beyond names and words. Poetry, here, is the expression of the human mind which has reached a perception of the world which it must express.’ When the human expresses the perception of being which opens up to this philosophical mind, he is not scientist, he is not even philosopher, he is poet: poetry, writes Heidegger, ‘brings being into the light.’ This is to say that our capacity for intense perceptive experience, and the rich expression of it, is part of what it is to be human. Poetry, in this case, goes beyond the literary form to take in other forms of creativity, such oral expression, writing, visual arts, music, science. In other words, it is the natural and, potentially, universal expression of what White calls this ‘sense of world.’ The ‘poetic’, in this context, becomes synonymous with human potential for constantly ‘making the world new’ (Bachelard 1958). I need to talk a little about this word ‘culture’ in this context. In geopoetics, ‘the fundamental question is cultural,’ but in the most expansive sense. In White’s view, culture is ‘the way human beings conceive of, work at and direct themselves.’ If ‘agri-culture means working at a field to produce the best crop,’ he writes, then ‘human culture means working at the most harmonious growth of the individual and the collective in its environment.’ In the collective sense, culture is defined as to what is essential to the group. Successful cultures cluster around a central motif, a nucleus of interest, a poetics, understood here as basic language of experience, perception and expression. Geopoetics is conceived of as a world culture; the Earth is the central motif. Caring for the earth is a fundamental part of geopoetics – a concern that is shared by all, north south east and west. This is not a homogenous world culture, but rather a world culture that recognises the creative relationship between humans and earth in all its diversity and particularities. White himself called gepoetics an ‘intercultural movement’ in that it not only recognises linguistic, cultural, poetic, philosophic and scientific diversity, but demands a genuine interaction among its various components. It requires genuine interaction of different worldviews, philosophies, sciences, geographies, modes of being, for the enlargement of human understanding of the diversity the cosmos offers (Hashas 2017). It is important to remember that geopoetics began in the 1970s. Theories on postcolonialism, feminism, multiculturalism, interculturalism, secularism, liberalism, environmentalism have all developed since, and so the geopopetic project is both part of this development and an interdisciplinary contribution to it. Keeping this context in mind, geopoetics can be read as a radical call for more critique, and more ‘opening up’ against dogmatic, ideological and religious discourses. In this sense, it is a strident challenge to all colonising homogeneities. Other disciplines can, in geopoetics, find similar potential. I want to speak briefly about my own field of Scottish ethnology here. Ethnology is a form of interdisciplinary anthropological research and practice that, at its heart, seeks to understand how we, as humans, make life meaningful. We might describe it as the study of how communities make sense of themselves to themselves in particular places through cultural memory and creative expression. Often, the focus is our relationship with the past and how we make sense of it in the present, and so historically, ethnology has been closely associated with its sister discipline of folklore and the study of local traditional culture. Ethnology values human relationships and emotional connections, recognises the diversity of human experience and understands the importance of our ecological connection to place. Through fieldwork, it bears witness to the experience of others and reflects the manifold and diverse ways human subjectivity and experience manifests itself, a celebration and appreciation of difference and diversity. With its emphasis on drawing global insights from consciously situated perspectives (‘Wisdom sits in places,’ Basso 1996), a Scottish ethnology is one of the world anthropologies in practice. 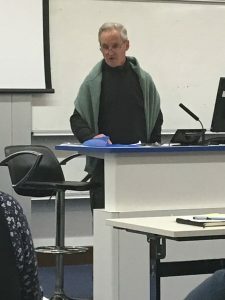 Here in Scotland – in part – in part a response to the cultural and political context in the aftermath of the 2014 referendum and ongoing debates in arts, culture and higher education – a group of ethnologists and creative practitioners have begun to explore the potential of a ‘creative ethnology’ outwith the strictures of the university. For some, the creative potential of ethnology is about finding more imaginative ways to share our research through creative output, such as performance or creative writing; for others the potential is in its interdisciplinarity: how we engage in vital dialogue with other fields, such as ecology or the arts. For others, this is not simply a question of drawing on the creativity of the category of ‘the artist’ in collaboration; there is a sense too in which we must become artists ourselves. I was keen to explore what a creative ethnology as a form of geopoetics might look like – the ethnologist as the figure of the poet-thinker, the artist-philosopher – and so took this question to the Expressing the Earth conference in 2017 (this, as I mentioned, is the topic of my essay in Stravaig). Ullrich Kockel – whose writing has been an inspiration to me – and I later co-wrote a chapter situating a Scottish creative ethnology in a European context, drawing on the rich wells of tradition and critical thought in this place. 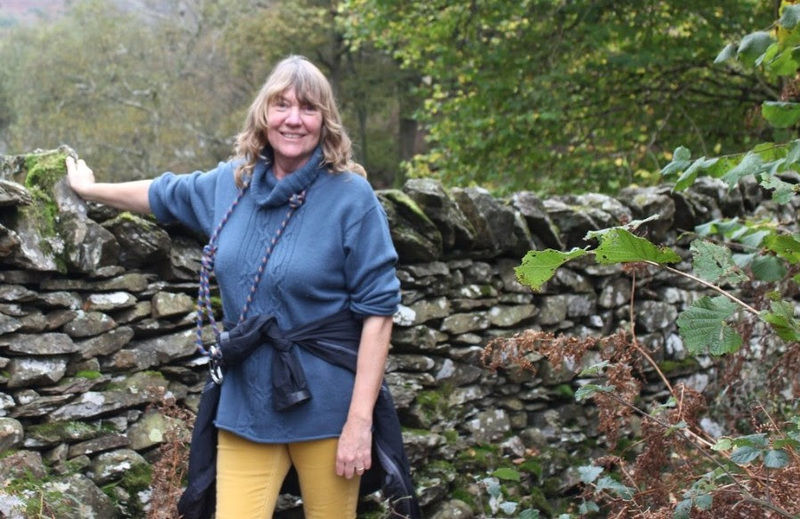 We evoke the metaphor of Nan Shepherd’s ‘Living Mountain’ – the topic of last year’s annual lecture ; Hamish Henderson’s metaphor of the ‘Carrying Stream’ – an affirmation of the living current of intergenerational transmission; and also the legacy of Patrick Geddes. Described variously as a Victorian polymath and ‘synthesising generalist,’ Geddes was looking for connections and patterns, and the intellectual tools to bring disparate ideas into relation, cultivating what he called ‘sympathy, synthesis and synergy. I have written about this elsewhere. In my own view, an ethnological sensibility or being-in-the-world speaks to the need for an activist orientation in practice. My point here is that, while geopoetics may appear to be largely a personal and existential quest, it cannot be only so. Simon Springer, in an article called ‘Earth Writing,’ (2017) writes that geopoetics demands praxis. He calls for a theoretically informed, critically reflective scholar-activism. In defence of any anti-intellectual accusation of ‘esotericism,’ which is a charge often levelled, he argues passionately that we need theory for meaningful action as much we need meaningful action to refine our theories. A geopoetic worldview, he writes, allows us to ‘replace the hubris that so often attaches itself to academia, with a modesty and humility that brings us into greater contact with the world.’ As ‘nomads of the present’ (Melucci 1989), we venture into the ‘unchartable terrain that is the mystery of life.’ As poet-thinkers, we acknowledge the ‘hidden enfolded immensities,’ ‘sheer physical messiness,’ and the ‘sticky materiality of practical encounters’ that can never be captured, pinned down, or fully understood. When we approach theory-practice with an open, geopoetic mind that ‘expresses reality in different ways … [through] combinations of different art forms,’ a material space for radical transformation might follow. ‘Possibility becomes possible’ when ‘the scope of theory and the hope of creativity collide in kaleidoscope’ (Springer 2017). In a sense, this is what I am striving for now, at the beginning of a journey towards an emerging geopoetic praxis. This part of my lecture really is an attempt to respond to the here and now, although these thoughts are very much unfinished. We are living through a very strange moment in human history, in disturbing and troubling times. 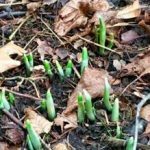 We face huge challenges: ecological and climate breakdown as a consequence of global capitalism and its environmental destruction; challenges to globalisation with the rise of right-wing populism and the retreat into entrenched ethnicities, Brexit, Trump, Brazil; Big Data… Our daily news cycle is a nightmare. Every conversation I seem to have these days finds its way back to this sense of disbelief, hopelessness, frustration, despair. All of these discussions hold up a mirror to our collective consciousness. In the face of it all, it’s an opportunity for reflection, and to ask again, why we are here, what does it mean to be alive? What can we do, how can we act? Where can we rediscover purpose, collectively? I was born in the 1980s. Since that time, the ascendant and dominant neoliberal agenda of globalisation has deeply transformed the material conditions of our world. Capitalism entered a new phase with the Thatcher and Reagan governments in the UK and the United States. Our society today has been shaped by ideologies and epistemologies underpinned by anthropocentric, hetero-patriarchal, Euro/Western-centric, colonial and capitalist systems of power. This has brought with it devastating social, political and ecological effects, leaving many people deeply dissatisfied, estranged and disempowered and may yet bring about our ultimate destruction. It is nothing short of cultural invasion on a global scale. In the face of such contemporary hegemonic forces, every aspect of our lives has been colonised, commodified, from birth to death. Our local and national government, cultural institutions, organisations, education system, universities have all been totally captured by this way of thinking. This reform of the public sector has been called the ‘era of New Public Management’ or NPM, where managerial practices used to run businesses are applied to the public sector. It is an ideology that many of us have been complicit in promoting, with or without choice, knowingly or unknowingly. I can only speak from my own experience of work, in universities and in arts and cultural administration. Higher education and research have been forced to conform to the norms of ‘efficiency, value for money, customer service and performance targets’ where ‘everything has come to depend on audits and metric standards of so-called quality assessment (student satisfaction, pass rates, league tables etc. )’ (Winkler 2018). Academics have little, if any, say on whether departments should continue to exist, what degrees and courses should be on offer and even what kind of assessment methods should be used. Researchers are forced into competition with an ever-tighter funding regime that values short-term instrumental usefulness rather than deep, long-term understanding. This colonisation of higher education by neoliberalism is an absolute assault on academic freedom. We see the co-option of radical language. The casualisation and precarity of the workforce. And yet, within this system, there are wonderful people trying to do wonderful things. 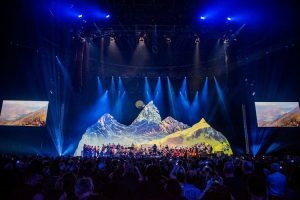 Our arts and cultural policy, again, has been totally colonised, not by one perceived nationality over another (as in Alastair Gray’s now infamous essay of 2013, ‘Settlers and Colonists,’ a different argument altogether), but rather by the ideology of the ‘creative industries.’ This is defined by in the UK Government’s 2001 ‘Creative Industries Mapping Document’ as ‘the potential for wealth and job creation through the generation and exploitation of intellectual property.’ Creative ‘production’ is about targets and outcomes, ‘value for money,’ anathema to the creative process. This name-making, logo-driven culture of neoliberalism demands of artists to ‘be a brand,’ to be a business, to ‘be our own export.’ Our role as cultural workers is to outflank or outmaneover the system, to be creative and agile, and yet all too often we are serving the very system that we seek to undermine, chained by our branded lanyards. Yet again, within this system, despite this system – many people still manage to create wonderful work and do wonderful things. Geopoetics calls for decolonisation: of the mind, of our ideologies and our institutions, of our everyday lives. It calls for resistance and transformation. Geopoetics reaches for a world culture where the Earth is the central concern. The point I am trying to make here is that our economic system and climate crisis are fundamentally linked. Our current predicament has led some commentators to describe our time as a new geological era shaped by humans – the Anthropocene (Hamilton et al, 2015). In their recent report, the IPCC have stated we have twenty years before a global disaster is upon us due to the effects of global heating and climate breakdown. This was shortly followed by the WWF’s Living Planet report with 60% of species wiped out since 1970, as a direct consequence of human consumption. This past week, as I mentioned earlier, a letter was sent to Parliament demanding action on climate breakdown. On Wednesday, we saw the launch of the ‘Extinction Rebellion’ in London – an act of civil disobedience where 15 people were arrested for protesting the government’s response to climate tragedy. The West’s response to these environmental issues, since the 1970s, have been individualist, market fundamentalist, incremental and atomistic – responses which have failed to solve the problem (Bendell 2018). If we are to try to change the direction of our own destruction, we need to challenge the systems and structures that dominate our existence. To achieve such a vision, we need a fundamental transformation of our lives and an extensive cultural change: a radical cultural renewal. Arguments about climate breakdown are really arguments about how and what we can think. The significance of these devastating statistics can be difficult to grasp. The ecological philosopher Timothy Morton calls climate breakdown a ‘hyperobject’ – a thing that surrounds us, envelops us and entangles us, but that is too big to see in in its entirety (2013). Mostly, we perceive hyperobjects through their influence on other things – a melting ice sheet, a dying sea. Hyperobjects happen everywhere at once, but we can only experience them in the local environment. I read a book recently, James Bridle’s The New Dark Age: Technology and the End of the Future (2018), a brilliant book – as illuminating as it is unsettling – in which I discovered an alarming fact: carbon dioxide is literally dumming us down. If C02 levels reach 1000 parts per million, our human cognitive abilities drop by 21%. In July of this year, academic Jem Bendell published a paper called Deep Adaptation: A Map for Navigating Climate Tragedy in which he offers a new framing for beginning to make sense of what we face. Bendell, himself a Professor of Sustainability Leadership at the University of Cumbria, believes that best-available science says that there is an inevitable near-term social collapse due to climate change, a process which has already started, and a process of which many mainstream sustainability professionals are in denial. This situation has led others to conclude that we should be exploring how to live in an unstable post-Sustainability situation, exploring post-growth or degrowth models. The current neoliberal system offers little hope for the kind of changes that will be needed and, further, it has the capacity to worsen the harm done to the Earth, and to impose greater suffering and oppression on the many in order to protect the power and wealth of the few. As an invitation to enter a dialogue, Bendell offers Deep Adaptation as a framework for communities to explore how they might to prepare for collapse, both locally and globally (I will outline this below). This framework has already influenced community dialogue on climate change in Britain in the past two years, including in Peterborough and Newcastle, as well as being used by the Dark Mountain network which many of you will be familiar with. There are the beginnings of a movement in Scotland too. Such an approach is seriously under-discussed because it has hitherto been taboo. Bendell recognises that this is a huge agenda that must involve diverse disciplines. Deep Adaption calls on nothing short of a world approach. There is much that geopoetics could contribute to such a framework – and perhaps we could discuss this later. Resilience is about developing our capacities to deal with change. The resilience of human societies is the capacity to adapt to changing circumstances so as to survive with valued norms and behaviours. We need to think again, switch our mindsets. What do we really want to keep? What can we draw on to help us through? The question, however, is not just about what we want to keep or preserve, but what are we willing to give up, to let go? This is relinquishment. It is about giving up expectations for certain types of consumption, assets, beliefs. This includes material possessions, ways of life, cultural patterns, patterns of behaviours. The current discourse of ‘sustainability’ might see this as defeatist, but it can be re-framed as a positive action. Finally, restoration. This is about finding ways to restore life and community, something I’ll come back to at the end of the talk. Examples include re-wilding and re-people-ing landscapes, so they provide more ecological benefits and require less management, changing diets back to match the seasons, rediscovering non-electronically powered forms of play and entertainment, and increased community-level productivity and support (Bendell 2018). I want to discuss the second of these for a moment: relinquishment. In order to find new ways of thinking and living – of survival – we are going to have to let go of a whole lot of things. This is a question I have been asking of myself in recent months. In many ways it is a difficult personal process; it involves a something of a deconstruction of the self, of a previously held sense of identity and expectations. Who am I and how am I in the world? What is my role? What am I willing (or not) to be complicit in? How (and where) do I want to live? What am I willing to give up? What am I willing to give up, to let go of? For me, this has involved some difficult life choices, and decisions to be made – both intellectually, critically, and sensitively, trusting my body. It involves both navigating and embracing tensions, contradictions and conflicts of trying to live as an activist (Erskine 2014). I am still in the midst of this unfinished process. The further I explore, it becomes increasingly difficult to work on projects that do not have some relevance to this wider interdisciplinary framework, this bigger picture. As researchers, artists, writers, teachers, scientists, creative practitioners, we have an opportunity – some would say an obligation, a responsibility – not just to do what is expected by our employers and/or the norms of our profession, but also to reflect on the relevance of our work within wider society, and for the world. We might ask, from what position can we effect most change? Where are the pockets of resistance? Where are the openings, pressure points, connections, networks? Where are the spaces for freedom of thought, action, imagination and transformation? Where are the spaces for celebration and disruption? How do we connect and support each other? In my own wanderings, I have found many people who are desperate to have this conversation. Geopoetics looks for signs of those who have attempted to leave ‘the motorway of Western civilisation.’ Many of us today are ‘nomads of the present’ (Melucci 1989), having left, in part, mainstream society, not knowing where we are heading but searching for what have not yet seen. Very quickly we might shed concern for conforming to the status quo and any desire for status, recognition or plaudits. Life becomes about finding and creating supportive networks and counter-cultural spaces in which individuals and groups can connect, think and act. While this picture I have painted is bleak, we do not yet know what the future holds. There are opportunities for change and for alternative visions to emerge that may offer new hope. In geopoetics we find an optimistic project for the future, a grounds for radical hope, despite the deep anguish that lies behind it. We need to understand and embrace our unfinishedness. To understand that we are always unfinished gives us radical hope that things can change, that transformation is still possible. Actvist Chris Erskine writes that this is a question of faith – not in a religious sense, but in the sense that ‘we must carry hope for things not yet manifest’ (2014). This idea of geopoetics, of ‘world-making’ has relevance for movement building; for creating and making manifest cultural renewal. Lastly, I want to talk about this idea of restoration. Restoring a live, lasting culture. We might think of this, in geopoetic terms, as finding a new ground. Restoring life and community. Recovering ‘a sense of world.’ Seeing life whole. To be fully human, to be fully alive. What practices might serve us, in advancing this collective-life-affirming cause? This might be to rediscover forgotten attitudes and approaches to life: ways of being, living, making, creating, crafting, eating. Living simply, living lightly. How did people celebrate and make meaning, prior to this hydrocarbon civilisation? What can we bring back to help us through this? Vital to this is conviviality. In conviviality, writes, Ian Wight, there is possibility. Anthropologist Edith Turner describes communitas as ‘collective joy’ (2012). It is ‘the sense of sharing felt by a group when their life together takes on deep meaning and collective awareness.’ It is ‘the gift of togetherness.’ Conviviality is the very foundation of community, of living together. It is more necessary than ever that we gather together and continue to explore how to live on this earth in more hopeful, joyful and life-giving ways. Inviting us to consider the challenges of the future – collapse as inevitable, catastrophe as probable and extinction as possible (Bendell 2018) – does not need to lead to apathy or despair. Instead, in a supportive environment, where we can enjoy community and conviviality with each other, something positive is possible – possibility becomes possible – and a radical hope can be found. On the macro scale, it can difficult to see the positives. On the micro scale, however, there are pockets of possibility all over the place. There are hugely positive stories to tell. There are glimpses of the future, of ‘a culture of possibility,’ right here in the present. Kockel, U. (2010) Re-Visioning Europe: Frontiers, Place Identities and Journeys in Debatable Lands. Kockel, U. (2011) ‘Morphogenetic Fieldwork and the Ethnologic of Toposophy: Mediation on a Coyote Wandering on Rannoch Moor’ in Beuysian Legacies in Ireland and Beyond: Art, Culture and Politics (eds) Christa-Maria Lerm-Hayes, Victoria Walters. Melucci, A. (1989) Nomads of the present: social movements and individual needs in contemporary society. 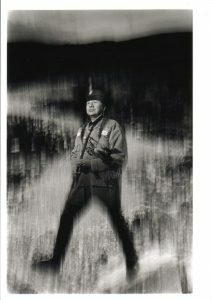 Walters, V. (2012) Joseph Beuys and the Celtic Wor(l)d.
Welcome to your Geopoetics newsletter for February with news and information about upcoming events in Scotland and beyond. Many thanks to everyone who sent in essays, poems, images and artwork for issue 6 of our online journal Stravaig. We received more submissions than ever before so it will take us some time to complete the editing. There will be more news to follow but in the meantime take a look at previous issues here. 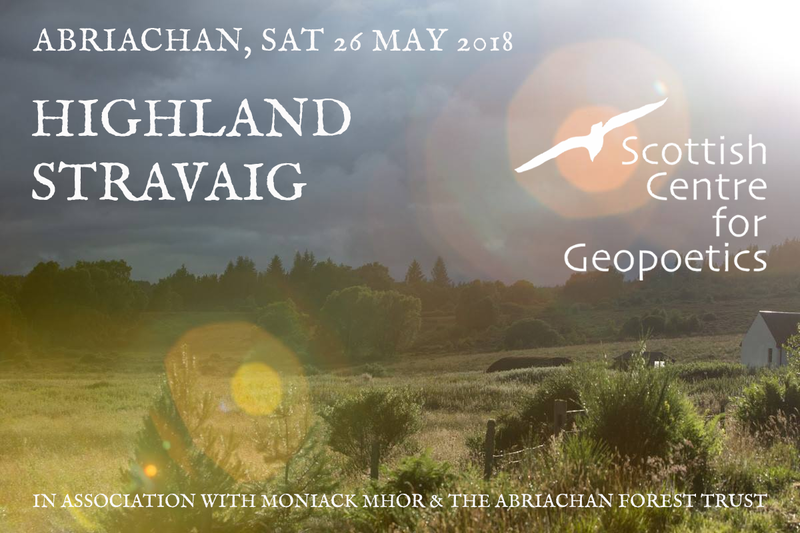 Our next event will be a Highland Stravaig on Saturday 26 May 2018 in Abriachan in collaboration with Moniack Mhor, Scotland’s Creative Writing Centre, and the Abriachan Forest Trust. Abriachan is a rural community set high in the hills above the western shores of Loch Ness. 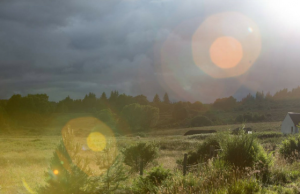 We will explore Abriachan both as a rich cultural and literary landscape and as a part of a diverse bio-region, reflecting on different creative, poetic and aesthetic ways of being in this place. 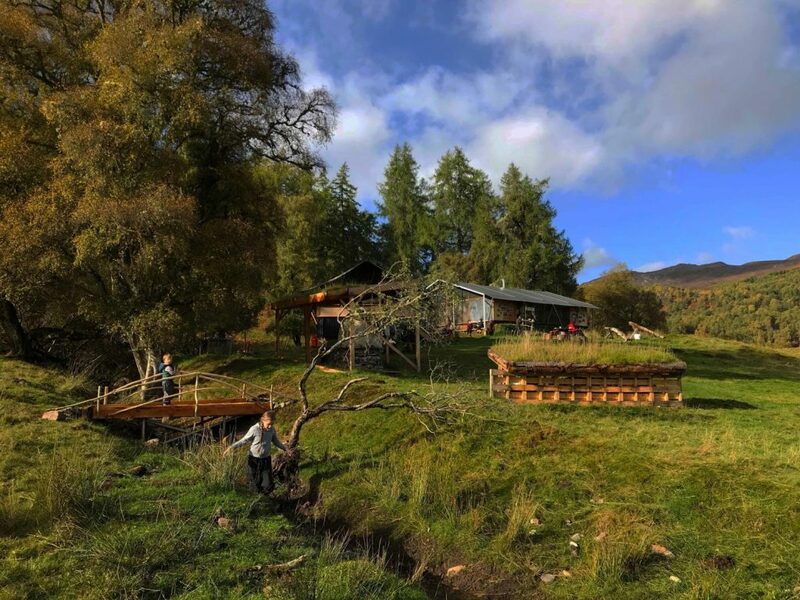 A live theme at last year’s Expressing the Earth’conference on Seil Island in Argyll was the contribution of geopoetics to modern land consciousness. There is a social and poetic link here: 2018 sees the 20th anniversary of the Abriachan Forest Trust’s community land buy-out in 1998, which followed the Isle of Eigg in 1997. This year’s Stravaig event is, in part, a celebration of this milestone in Abriachan’s history. 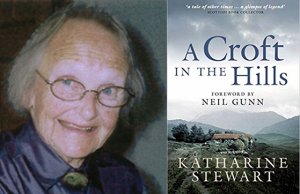 Local writer Katharine Stewart (1914 – 2013), a former member of the Scottish Centre for Geopoetics, played an important role in this story. Stewart’s writing – including A Croft in the Hills (1979) and Abriachan: The Story of an Upland Community (2000) – is celebrated this year by Moniack Mhor with a bursary for aspiring nature writers and writers of historical fiction. 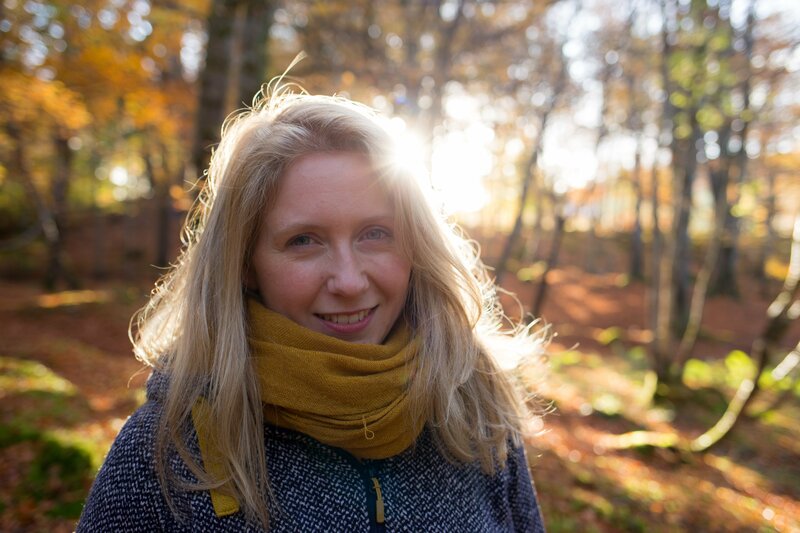 Following the inaugural Tony McManus Lecture on ‘Nan Shepherd as an Early Geopoet’ by James McCarthy in November 2017, we will also reflect on the work of local author Jessie Kesson, who, upon a chance meeting with Shepherd, was inspired to pursue her writing. 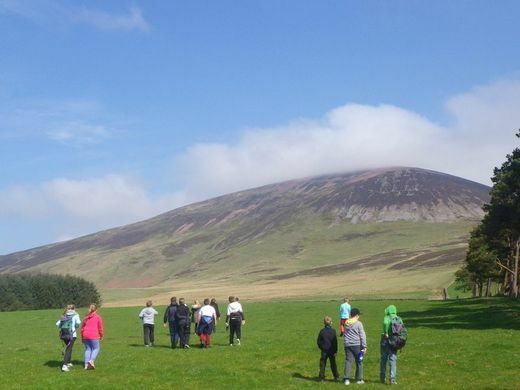 To introduce the day, we will discover more about the story of Abriachan from leader of the Forest School, Suzann Barr, and Gaelic expert Roddy MacLean will share his deep knowledge of Gaelic place-names, native flora and fauna and local geodiversity on a forest walk in the shadow of hill Carn na Leitire (outdoor wear recommended!). In the afternoon, following a lunch of soup and bread, we will hear from ecologist and international river campaigner Lucio Marcello – who is currently investigating archive materials to chart the impact of dams and other land use changes on the biodiversity of the Ness river system – and from writer and cartographer Raghnaid Sandilands who will share her creative approach to landscape and cultural memory. Following some free creative time in the afternoon, we will traverse 1.4 miles up the road to the Village Hall. Writer and musician Heather Clyne will introduce us to the work of Jessie Kesson with a selection of readings on a short walking tour through the village. This will be followed by a hearty shared meal in the hall and an evening ceilidh with opportunities for open floor contributions. Music for dancing will be provided by the local ceilidh band. Email Mairi at geopoetichighland@gmail.com for further information. 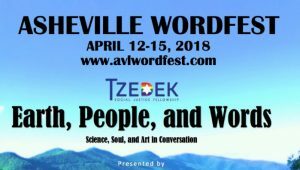 Norman Bissell and Alastair McIntoshwill travel over the Atlantic this April to speak at Asheville Wordfest in North Carolina on the theme of science, soul and art in conversation. The event is organised by Laura Hope-Gill, who attended the Expressing the Earthconference last year. 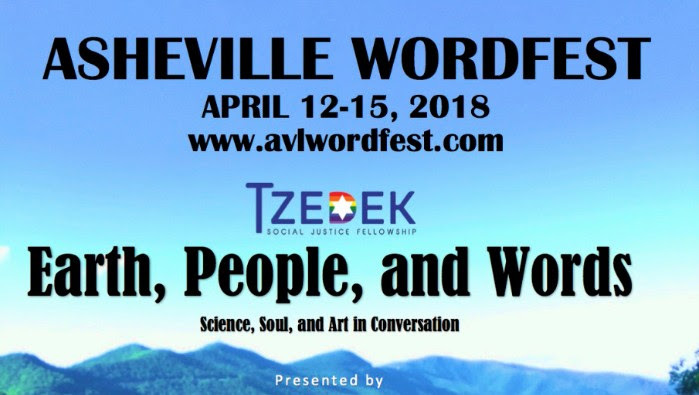 Laura is a writer, poet, architectural historian, film-maker, teacher and directs the Thomas Wolfe Center for Narrative at Lenoir-Rhyne University in Asheville. Read more. Write in Nature at Eycott Hill, Cumbria Wildlife Trust Nature Reserve, free workshop details here. 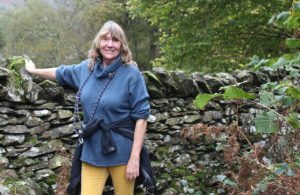 Midsummer Poetry residential course at Brantwood, Coniston, Cumbria with co-tutor Pippa Little. Booking is through Brantwood Details here. Please send information about geopoetics related publications, news and events for our next Newsletter to normanbissell@btinternet.com. Happy New Year! This newsletter is a reminder about upcoming deadlines and contains some new information about events and opportunities in 2018. Stravaig is the online journal for the Scottish Centre for Geopoetics. We invite you to submit essays, poems, artwork and images for the next issue on the theme of ‘Expressing the Earth.’ We would especially welcome papers, articles and creative work from those who attended our June Conference. Essays max. 4,000 words, no more than 4 poems/images. Our editorial group consists of Norman Bissell, Mairi McFadyen, Ullrich Kockel, Elizabeth Rimmer and Caroline Watson. Our next event will be a Highland Stravaig in Abriachan above Loch Ness (near Inverness) on Saturday 26 May. 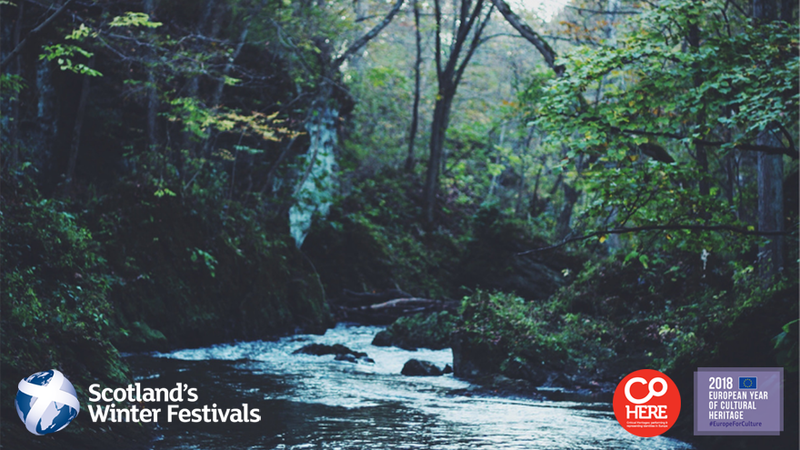 The event will be in association with Moniack Mhorand the Abriachan Forest Trust. Following our discussion on Nan Shepherd, we will reflect on the work of Jessie Kesson, explore the local cultural landscape and its biodiversity and celebrate Abriachan’s role in land reform (2018 is the 20th anniversary of Abriachan’s community buy-out). Full details to follow. Email Mairi McFadyen for more info. In celebration of the life and work of Abriachan-based Katharine Stewart, who was a former member of the Scottish Centre for Geopoetics, Scotland’s Creative Writing Centre Moniack Mhor are offering the prize of a place on either the Nature Writing or Historical Fiction course to a writer in 2018. Open to unpublished/published writers living and working in the Highlands who have or would like to have a piece of work in development. Read more here. I’m honoured to be asked to give this inaugural lecture in memory of Tony McManus, who was crucial in the establishment of the Scottish Centre for Geopoetics. Although I never knew Nan Shepherd personally, I feel a strong association with her not only through her own writings, but also because of my own connections to the area she wrote about, and I hope you will indulge me in my use of her forename throughout what follows in this talk. 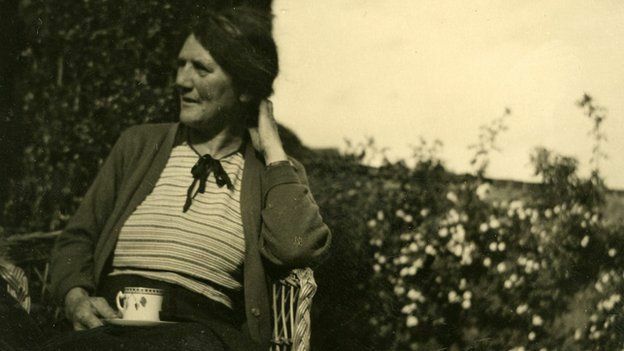 I first encountered Nan Shepherd in the relatively recent writings of the landscape writer and broadcaster Robert Macfarlane – and was quite captivated. It was he who identified two seminal ideas in Nan’s writing on mountains: ‘We don’t walk up a mountain, but into it’, and secondly that ‘we must abandon the summit as the organising principle of mountains.’ She was in good company with that other unrecognised geopoet, (before the term was invented) John Muir, who said that ‘going out is actually going in.’ It was Macfarlane, among others, who also claimed that Nan coveted knowledge and willingly suffered privations (witness her arduous treks into the mountains in all weathers) in the pursuit of learning. But she was also a person of passions and lived life with gusto, represented by the quote outside the Writers’ Museum in Edinburgh ‘It’s a grand thing to get leave to live.’ Macfarlane, author and acclaimed landscape afficianado claimed that her major poetic work In the Cairngorms was one of the most brilliant works of landscape literature … ‘no one has written as well as Shepherd about what it feels like to be in the mountains.’ Almost all her poetry hymns the combination of nature and intellect, while In the Cairngorms is like her novels in the sense of the mind’s own fineness, passionately engaged with the vastness, beauty and ultimate indifference of rock, water, light and air. Nan lived all her long life between 1893 and 1981 in Peterculter outside Aberdeen and was proud of this association with the north-east of Scotland. After several years as a student in Aberdeen, I have come to terms with an impression of deep parochialism in the culture of this area, now considerably diminished by the advent of the North Sea oil industry – as one wag had it – ‘A day oot o’ Aiberdeen is a day oot o’ life’. She was an Aberdeen University graduate who maintained a close link with her alma mater throughout her life. Born to a middle-class family, she nevertheless developed a remarkable insight into the life and language of the poor farming communities of the rural hinterland, described, often through dialogue in the local vernacular, in her three novels. Published in the short period between 1928 and 1933, they are now recognised as significant contributions to the Scottish literary renaissance of that time, set in the small communities of north-east Scotland – a largely unrecognised precursor of Lewis Grassic Gibbon’s much lauded Sunset Song. 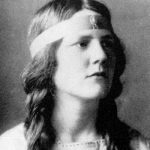 She was a pioneer in women’s writing in Scotland, focussing especially on their struggle to escape a patriarchal society. Jessie Kesson attributed her own start in a distinguished writing career to Shepherd’s advice and encouragement: Kesson said that Nan possessed ‘a grace of the soul’ expressed in discretion and reticence. But she was also a valued confidante of Hugh McDiarmid, Neil Gunn, and many other literary figures. It was Gunn who thought that her now most acclaimed work, The Living Mountain would not appeal to publishers. Nan herself describes the writing of this work in the last years of World War II as ‘my secret place of ease’. Barely recognised in her own lifetime, she was in fact a major contributor to Scottish Modernist literature. Nan was a charismatic teacher of English – she has been described by one student as having a spell-binding teaching talent – and took a feminist approach in her lectures years ahead of her time, initially at the Aberdeen Training Centre for Teachers (subsequently to become the Aberdeen College of Education) throughout her working life. She encouraged her students to embrace the wider world, but not to despise their often impoverished backgrounds and to constantly seek fresh knowledge – a topic reiterated in her novels around her country heroines. But in keeping with the title of this talk, I want to focus on her non-fiction, even if she regarded poetry, such as that in her work In the Cairngorms, as the purest of all forms of writing. 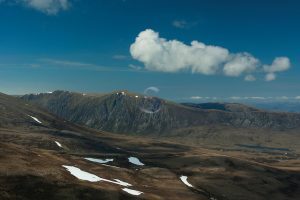 A dauntless hill walker, she organised trips for her students into the nearby Cairngorms, introducing them to the geology and natural history of the largest area of subarctic environment in Britain, with all its wonders. It was my former colleague, Dr. Grant Roger, who introduced Nan to the botanical riches of the massif. But it was Grant’s sister, Sheila Roger, who came to know Nan most intimately: as the young child of a neighbour, she recalled lying on Nan’s bed, being read to by Nan and encouraged to take an interest in everything around her (Nan remained unmarried throughout her life, although her poetry obliquely suggests a doomed love affair.) 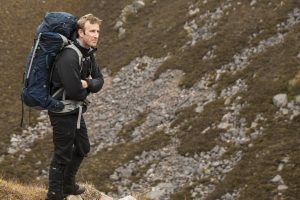 Later Grant and Sheila were to make many expeditions into the Cairngorms with Nan and accompanied her on trips to Europe. Nan was known for her emphasis on getting to know the geology and natural history of particular areas such as the Cairngorms. She had a deep kinship with nature, a spiritual connection which had a Buddhist outlook as a pilgrimage into being. Her influence on her students can be gauged by the number who, often established in one-teacher schools from Galloway to the Northern Isles, invited her to stay with them. It was her last work, The Living Mountain, published in 1977, having lain unregarded in a drawer from the 1940s, that establishes her as an original geopoet for its extraordinary deep and personal identification with the natural environment – a meditational work with Zen-like undertones. The title of this work absolutely encapsulates Nan’s approach to the mountain landscape. Abjuring the predominately male preoccupation with conquering summits, she described her stravaiging into her beloved mountain range as a journey into Being. I use the word into very deliberately as it expresses both the outward and the inward journey, while not neglecting the sensual pleasure of the body’s response to activity, especially energetic walking. It has resonances with Thich Nhat Hanh’s walking meditation, in which, in Macfarlane’s words, she refined her philosophy. ‘The mountain does nothing, absolutely nothing, but be itself.’ said Nan. 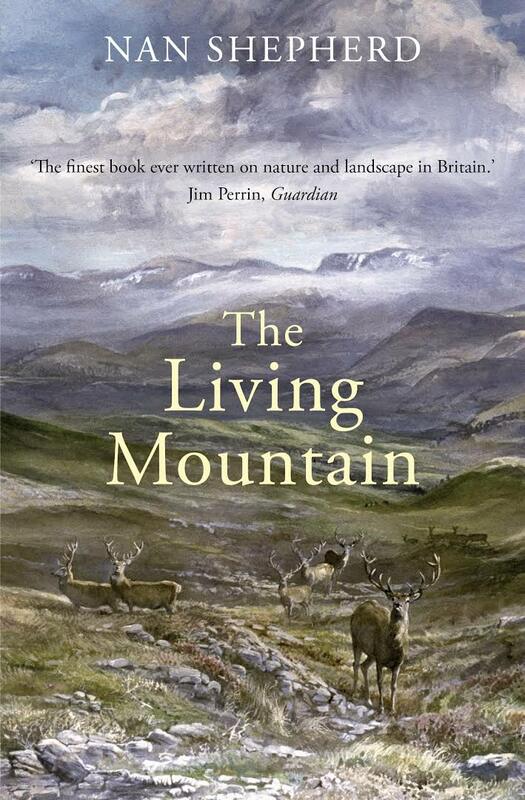 Ali Smith describes The Living Mountain as ‘an enlightened fusion of philosophy and reportage of the form and force of life everywhere in the beloved landscape’. It is now recognised as a masterpiece, amongst the greatest works of nature writing to come out of Britain. Ali Smith together with the poet Kathleen Jamie have both acclaimed Nan’s works. 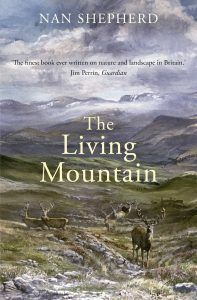 The publisher Canongate has reissued her works and recently sold 45,000 copies of The Living Mountain, while the rights in China have gone for the largest amount ever paid for one of her books. She lived on her own terms, unafraid to walk the hills without destination, but allowing her senses to respond to every sight or sound which she experienced – what she described as ‘the elementals.’ She made a habit of sleeping out of doors on her own among the high tops. In Macfarlane’s words, she entered a geopoetic quest and philosophical enquiry into the nature of knowledge. There was no difference between body and mind in the sensing of textures and surfaces of rocks, wind and water and her interactions with wildlife be they plants, animals or birds. I can recall two comparable personal experiences which approximate to Nan’s own. The first was when, as a young schoolboy, I crossed the River Tay from my home town of Dundee into Fife and simply started walking. A wood on a hill slope looked inviting for my sandwich lunch and I wandered to the skyline on one of those rare days when there was a slight breeze, but the sky was springtime blue. There had been some recent felling of the Scots Pine and a cut stump provided a convenient seat. The only sound was the wind bending the tops of the trees, but the early warmth of the sun brought out the aromatic fragrance of the needles which I had never smelt before. The rough-edged lozenges on the salmon-pink bark formed endless patterns of light and shade. Beyond the crowns of the trees, I could see the patches of sunlit sky. There came a point where I could not distinguish that sky from the scent of the conifers, from the wind on my cheek, or the bark scales in front of me on the felled logs – they were all gloriously one. I was deliciously intoxicated with this world, transported by a sense of clean beauty which could not be grasped and which could not have come in company. I was aware of myself and of the trees and everything else in my surroundings, but without any space intervening – a feeling of both peace and jubilation, together with a deep sense of belonging to this scene. More than 20 years ago, I found myself on one of the last undeveloped stretches of the Maine coast in USA, south of Acadia. This was The Country of the Pointed Firs so beautifully delineated by Sarah Orne Jowett in the dying years of the 19th century. Living in a remote lighthouse, I was carrying out a commission from the US National Park Service to investigate a potentially contentious proposal to create a new national park on this coast. After a late night writing up notes, my head still buzzing with all the conflicting issues involved, I rose very early for a run through the nearby coastal woods. There was an old Indian trail that skirted the cliffs. A deep morning mist intermittently shrouded both the cliffs and the forest of spruce, fir, birch and cedar which reached down to the shore around inlets. Elsewhere, the jagged black and grey rocks were barren except for orange lichens which reflected a splash of colour. The woods themselves were carpeted with velvety emerald mosses below an understorey of low woody shrubs. The silence and the damp air were a tonic to the body and the brain. With a path that gently undulated and wound its way round the clifftops, I soon recovered from the first minutes of awkward stumbling over roots and found an easier rhythmic stride. Along the trail, there was evidence of moose and black bear. 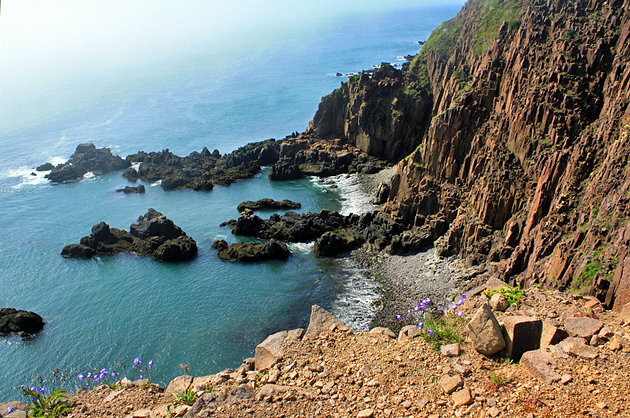 Occasionally the mist rose above the woods to reveal a glimpse of the Bay of Fundy, in the distance, with its spectacular tides. There was an ethereal atmosphere – a combination of windlessness and calm sea, only seen in gaps between the trees, while the suspended cobwebs glistening with morning dew, created their own ghostly miasma. I felt my running was good and almost effortless on the spongy mat of the trail. My own breath, in this morning cold, was creating miniature grey clouds. I could hear my breathing, but I became aware of something that sounded like an echo to my left which I could not identify. I kept going, enjoying the exhilarating rhythm of running, but increasingly aware that my passage through the silent woods was punctuated by a parallel movement to seaward. Just the noise similar to that expellation of the cleansing breath of a Tai Chi exercise, when you are encouraged to make a natural ‘whooshing!’. Unable to see clearly through the undulating coastal mist, the low whistling seemed to keep pace with my own progress, an almost eerie reflection of my momentum, rising and falling. The half-closed mind clicked. Whales! Through the trees and the mist, nothing could be seen of the creatures. But with my ears now attuned, and my remembrance of reading of the several species of cetaceans which ploughed down this quiet sound, I was in no doubt. I could hear them but, pounding over the moss, could they hear me? Whatever, their need for air and my own seemed to create an umbilical cord across woods and water, both of us floating in our distinct but united worlds, moving down the coast. Some of us have experienced and remembered that early elation. Where the landscape in her fiction shows the possibilities of freedom for her characters, both male and female, it does the same in The Living Mountain for the self. In my own work as a professional conservationist within an organisation which prided itself on its scientific objectivity, I could not allow the poetic and the philosophical to intrude into the papers I prepared for sceptical committees. I now realise that this constraint allowed me to see only one part of the picture and perhaps the minor part. Macfarlane, a writer of the greatest sensitivity to the Highland landscape, described The Living Mountain as a sensual exploration of the area and claimed that it had quite altered his vision of this mountain range, which he had previously known intimately. It has quite altered mine. The following is written as if spoken. It is, however, a reconstruction from subsequent memory, plus some elaborations to what I said at the conference – Expressing the Earth, organised by the Scottish Centre for Geopoetics and the University of the Highlands and Islands on the Isle of Seil, 23 June 2017. The pictures are a small sample of what were used during the talk. For greater detail, including my use of Kenneth White’s poetry in my activist work, see Soil and Soul: People versus Corporate Power, Aurum, 2001. My latest book, Poacher’s Pilgrimage: an Island Journey (Birlinn 2016), shows in an implicit way the impact of geopoetics on my work in the course of exploring what I think of as “an ecology of the imagination”. I have just come back from speaking on the Isle of Eigg. 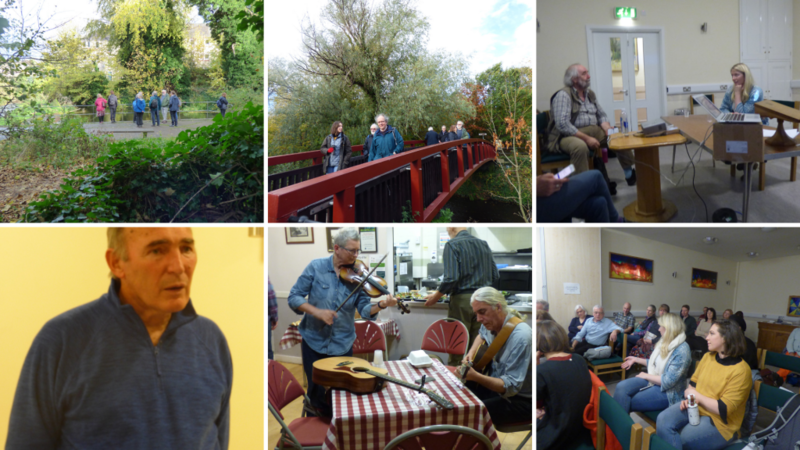 There, on June 12, we celebrated the twentieth anniversary of the buyout into a community land trust. It is the second such birthday this year. A few months earlier, we had celebrated the twentieth year of the GalGael Trust in the Greater Govan area of Glasgow. Our people there build wooden boats. These reconnect an urban people with their wider coastal heritage. We see our work as geopoetics applied, and since the early days, have been honoured to have had Kenneth White as our patron. White’s words that follow speak to the condition of so many of our folks – lives that have been blighted by poverty, but uplifted by humanity; the dreich offset by glory. 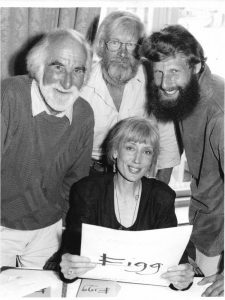 It rather thrills me that Hilda Ibrahim, the mother of Gehan Macleod who co-funded the GalGael Trust in 1997 with her late husband, Colin, is today the retired schoolteacher who chairs the Eigg Residents’ Association. There we glimpse the Möbius strip that turns the urban to the rural, the rural to the urban, reconnecting the flows of life between our communities. Veteran land campaigners at Eigg’s 20th Anniversary Celebrations, 12 June 2017: Camille Dressler, Maighread Foxley, Karen Helliwell, Michael Foxely, Michael Hutchison and vintage Talisker (Picture: Alastair McIntosh). Today, however, my focus is to be rural, for I was one the four trustees who founded the original Isle of Eigg Trust in 1991. My swansong in 1997 was to sign over the balance of the £1.6 million in trust funds that had been raised in a worldwide campaign by the resident community. 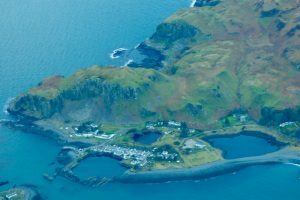 With this, the island was purchased by the more fit-for-purpose Isle of Eigg Heritage Trust, set up to represent a partnership between the islanders, Highland Council and the Scottish Wildlife Trust. Eigg was the first full scale modern community buyout – full scale in the sense of being more than the crofting (or small scale agricultural) tenants alone, such as had been the case with the Assynt Trust. The drama that unfolded on Eigg helped to set a pattern and example that has inspired many buyouts since. Today, it receives visitors from all over the world who come to learn about its community-run renewables electricity grid, social and ecological housing, the ecological regeneration of nature, small business development such as the micro-brewery and an ever-growing wealth of experience around the gritty task of doing community. In that task one is, not least, forever on a learning curve of recognising and processing the conflicts that are inevitable in being human. “Towards the human”, to borrow from the title of Iain Crichton Smith’s collected essays, is always (in the work of making community) the guiding star that nods to incompleteness, yet points towards an opening of the way. On a national scale, twenty years on, we now have land reform legislation in place, a £10 million per annum government Land Fund financed by imposing business rates on sporting estates, and over half a million acres of Scotland now held by dozens of local land trusts. That’s getting on for three per cent of our land area, and the Scottish Government has set the goal of doubling it by 2020. The tiny channels that campaigns like Eigg, Assynt and Gigha opened up have become the conduits through which a much more mainstream political flow has followed. That brings me to the poetics, to Hamish Henderson’s dictum that “poetry becomes a people.” As activists for social, environmental and perhaps other forms of change, ours can be a bardic politics. The politics of a people resourced by their poetry. Ours is not to stand in the mainstream, but to open out fresh conduits of the mind. We may not have much to dig with. We may only have a teaspoon. But that can make a start upon the most compacted soil. I remember, back in the days when I worked in a remote area of Papua New Guinea, a dear Australian priest called John Flynn who was building an airstrip. It was to serve the village of Hauabango, to which he had devoted a large part of his life. Fr John had no mechanical diggers with which to level a slither of the mountainside. Instead, he used a technique that he nicknamed “water mining”. He got the people digging narrow channels using spades. Into these, the local stream was diverted. When it flooded to a spate, the channels widened and the water also carried off unwanted earth. 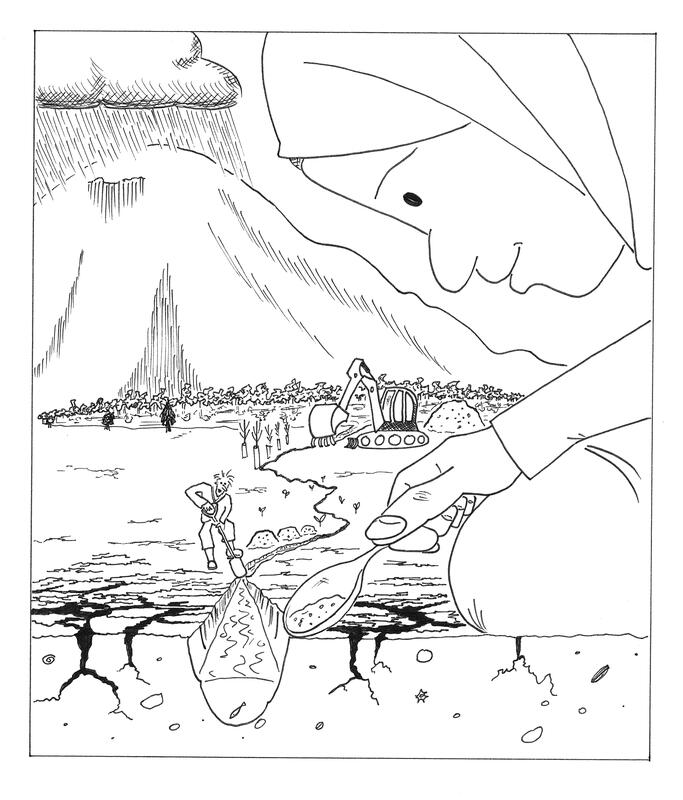 “We may not have much to dig with. We may only have a teaspoon” – Cartoon courtesy of the Leeds activist, Matt Carmichael. Now, the cynics say “you can’t eat poetry”, but I want to put it to you today that land lies at the base of the food chain. As a storyteller once said long ago, “Man shall not live by bread alone.” Whether with the Assynt crofters’ buyout, or in the example involving Kenneth White that I am about to give, poetry has played a role in modern Scottish land reform. Personally, I would call it the lifeblood. I use the term “poetry” to mean both poems, but also, the wider sense of creative quiddity that infuses all true arts. And by “true” art forms, I mean those that come from somewhere deeper than the ego – those that emerge from the collective levels of consciousness. Those which are, as the Hebrew prophets might have said as they railed against the injustices of landlordism, moved by inspiration from beyond our conscious ken. Moved by the echoes of a distant tide that draws us into ever-deepening openings of life’s way. 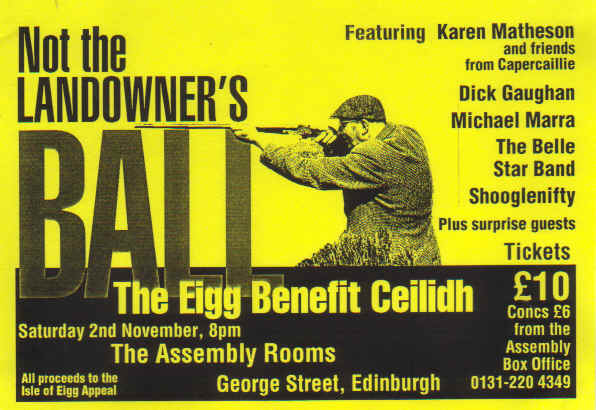 I think of a time during the Eigg buyout campaign – it was in 1996 – when, to get the fundraising rolling, the broadcaster and activist Lesley Riddoch organised a gig called Not the Landowner’s Ball. It was held in the Assembly Halls of Edinburgh. The late (as is now) Angus Grant of Shooglenifty whipped his fiddle into spindrift spirals of shamanic ecstasy. The crowd responded. I have never before, nor never since, danced in such a frenzy. This was the magic happening. This, we knew, was Eigg “happening” – manifesting from some realm invisible before it manifested outwardly. That, by the way, is how the spiritual materialises, how poetry becomes a people. I doubt that any who were there that night would not have felt the bedrock skirl of Scotland’s metamorphosis. up at the back of my skull. Now, a poem like that, a Haiku or however it would be classified, is more than just a ditty. It is a power cable. Its effect, for the four of us at least, was to mainline legitimacy. As Bob is no longer on this Earth, as Tom is in an Ullapool care home, and as Liz drew back from the Trust soon after it was launched, let me speak for myself. What emerges from the latency of that white silence comes a claim of right. A clean sheet of paper on which to write a different title deed. A claim that we, in our claim of right to freedom, are all the “owners” of the land; or as I prefer to say, “landholders”. Landed power can lay its claim to no such charter. It lacks the moral authority of standing, to borrow from Hamish again, in the “carrying stream” of the cultural flow.4 For me at least, Kenneth’s poem became a white steed on which to ride into the fray, from which to perpetrate our tactic of buying Eigg cheaply through market spoiling. After all, what rich man would want to buy a holiday island stuffed with restless natives? If the “landowner” poem affirmed legitimacy, these lines from “Walking the Coast” affirmed the emergence of vision. Put it like this. Imagine trailing up and down between the Central Belt and Eigg for meetings, sometimes hitchhiking on very little money, sometimes secretly crashing out for the night in the unlocked St Bride’s Church at Ballachulish to break the journey. And imagine Tom Forsyth, sleeping literally in ditches wrapped in his yellow oilskins as he criss-crossed the country doing drystane dyking work to raise some £3,000 legal and other costs of setting up the Eigg Trust. Sure, you can’t eat poetry. But you can ride it. And ride it hard we did. Trustees of the original Isle of Eigg Trust, back in our Taliban days – Bob Harris, Tom Forsyth, Alastair McIntosh & Liz Lyon (Glasgow Herald, 1991). What’s more, in the last couple of decades of the 20th century we were in a climate in Scotland when poetics were quickening at the grassroots. The music of Runrig, Dougie MacLean, Karen Matheson and some of the Irish groups were wake-up calls. On Eigg, as in many other small West Highland communities, the Fèis (“feast”) movement had spread out from Barra and was reconnecting people to their cultures, their music and their untold stories.6 Partly inspired by a worldwide resurgence in the consciousness of indigenous peoples, this sat comfortably with “world music” and was inclusive of whoever chose to belong by participating. For me, as Eigg was unfolding as the weft of this wider leap in warp speed, so too was the Isle of Harris superquarry campaign. Roineabhal is the highest and most majestic mountain that graces the National Scenic Area that covers South Harris. 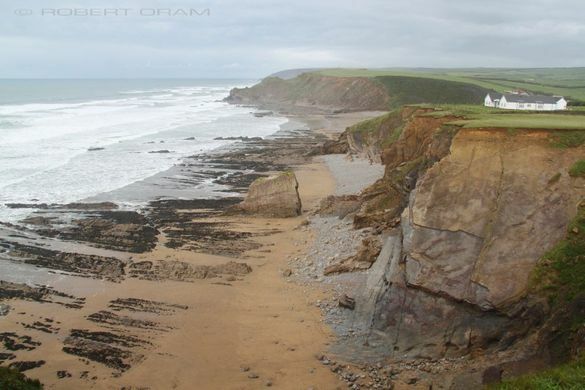 In 1991 it fell under the threat to turn it into the biggest roadstone quarry in the world. For me, and I must stress that this is a personal take, what was happening on Eigg interwove with what was happening on Harris, and also with campaigns like the M77 “Pollok Free State” motorway campaign that evolved into the GalGael Trust. It took until 1997 for Eigg to come under community landholding, and 2004 for the superquarry campaign to be decisively won as the result of a massive, multi-layered environmental campaign with many actors. Throughout that decade-and-a-half, however, geopoetics was exploding into consciousness in Scotland. Kenneth White himself was resident in Brittany, but his patch was held and cultivated largely thanks to the efforts of the late Tony McManus and Norrie Bissell. Other figures who breathed life into geopoetic events of that era include Rachel Blow, Richard Browne, John Hart, Nanon McManus, Bill Taylor, Jennie Renton and Graham Urquhart. I remember how my Quaker friend, the wooden boat designer, Iain Oughtred, plied me with copies of the publications of the Open World Poetics group and bootlegged recordings of White’s recitations. Similarly so, Colin Geddes, the grandson of Patrick. I had been a science student in my youth. I was ignorant of poetry, but friends like Iain and the botanical writer, Tess Darwin, took it on themselves to complete my education. Whether it was Alice Walker, Adrienne Rich, Walt Whitman, the emergent young Gaelic poets in translation or Kenneth White, the blue touch papers that they lit went off as rockets in my mind. Neither was it a solitary experience. During the 1990s there was a positive buzz around geopoetics, largely stimulated by Tony’s and Norrie’s events and publications that put a saddle on the galloping back of poetry such as amateurs, like myself, could mount and use to get a grip. It was not just the written word. It was also the remarkable tonal qualities of White reciting his work, and the mind-boggling span of his talks during his fairly frequent visits back to Scotland. It was to me a balm of inspiration. The superquarry scene was looking grim. The major environmental agencies – the Friends of the Earth Scotland, WWF, RSPB, and all the rest of them were trying all the conventional means – the economic arguments against the quarry, the ecological ones, the social and you name it. Somehow the rationality of the impending government public enquiry wasn’t going deep enough. White and MacDiarmid ran side-by-side in my mind. “I lift a stone; it is the meaning of life I clasp,” says MacDiarmid’s “On a Raised Beach”. And there, in the old master’s footsteps, White the shaman monk weaves his spirit with the Celtic monks as he wanders, as a nomad, into “Labrador”. 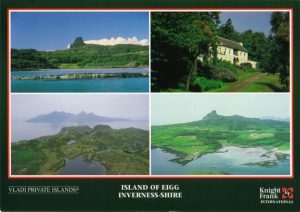 Eigg sales brochure – it really was marketed by an islands brokerage called Vladi Private Islands. My reader today must forgive me if this sounds a heady mix. It was. Geopoetics became pivotal to the curriculum of the MSc degree that I directed. We had White visit us in the human ecology classes at 15 Buccleuch Place. Other times, I’d play extracts of him reading from his epic poem, “Scotia Deserta”. It changed lives. What I am beginning to sense is that consciousness is infinite. Looking back at how trapped inside the glass bottle of my own ego I used to be … [I now see that] it is only by quieting the ego that we may have the awareness to experience the world more deeply, more groundedly and more colourfully. Whittle reflects how Labrador “captures those first footsteps into a transpersonal world.” It had carried him into an age “beyond rampant industrial growth and collateral environmental damage.” It opened to “a new space beyond neurotic frenzy.” Such is the space, he concluded, “that can be found when we connect with the larger non-human world.”8 Some would call that ecopsychology. Others, ecopoetics. Naess called it Deep Ecology. Whittle found it here in Scotland through White’s geopoetics. Poetry precipitated necessity. Sulian Stone Eagle Herney, then the war chief of the Mi’Kmaq Nation in Nova Scotia, had been credited with stopping a similar superquarry at Kluscap Mountain, the sacred mountain of their territory. To cut a long story short, he answered my call and agreed to give testimony at the Scottish Office (government) public inquiry in 1994. The media went ballistic. “Stone Eagle flies in to stop superquarry” ran the headlines. The detail can be read elsewhere.9 Suffice to say here that the chief’s testimony, along with mine, and that of Professor Macleod of the Free Church College all on the same platform – all that triple whammy – merited a single paragraph in the inquiry’s multi-volume report. We had zero legal traction. But that was not the point. We were doing poetry, and theology; not law. We were quite consciously seeking impact in a different universe of discourse. It had massive traction, both in PR terms as the TV and press cameras zoomed in, and in terms of deepening local thinking about the issues at stake. Much of the Isle of Harris is now owned by community land trusts. The place has moved from falling derelict, to thriving. The young are coming back. There is affordable social housing, business units, renewable energy and jobs created by a newly energised economy and culture. All that, without the superquarry. Who said “you can’t eat poetry”? Who … said it? I’d like to know who tried to lead us astray with that put-down. Who tried to close our eyes? The sphinx failed. The superquarry, like landlordism on Eigg, was thwarted. Why? There are many reasons, many winds that blew in different directions at different levels of the stratosphere. But one reason stands out for me. The sphinx failed, because it never knew that we, too, were landowners. We, too, had twelve acres of white silence up the back of our skulls. Anent the cost and even the peccadilloes that may result from the gravity of what we carry, I recall an incident when Chief Stone Eagle came to Scotland. I had taken him to several of the isles. At one point, I felt the need to apologise for the behaviour of a certain tradition bearer who had let us down by having had too much to drink. “Don’t you apologise for old (so-and-so),” the chief rebuked me. “You’d be drinking too if you were carrying what he carries.” As Cairns Craig has remarked, “White remains somewhere in the margins of modern Scottish literature and yet if there is one Scottish writer with a truly European reputation, it is him.”13 There may be ways in which he has contributed to that marginalisation. A prophet finds it hard to work from home, just as “home” finds the prophet trying in its midst. That said, White’s work would never have reached so many of us were it not for the people and movements that surrounded him. I have observed an immense generosity of spirit in the geopoetics movement. I single out what I know best, specifically, the graciousness that has characterised the endeavours of Tony McManus and Norrie Bissell. Norrie, after Tony’s untimely passing, has carried forward the earlier work of Open World Poetics into the Scottish Centre for Geopoetics with its online journal, Stravaig. That word, delightfully, means, “to wander aimlessly”; and one glimpses here a Labradorian aimlessness where aims themselves are stripped back down as “outworn language”. From where might this nomadic stravaig come in White’s psyche and his writing? I sense a clue within the title of his essay, “A Shaman Dancing on the Glacier”. 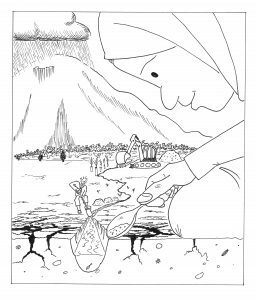 It appears in the collection, On Scottish Ground, but the version I had long worked with first appeared in the arts newspaper, Artwork, in 1991 just as Eigg and the superquarry campaigns were born. That title alone was enough to impact heavily on me. Why? Because always for the activist, a pressing question when the going gets costly, is: “Why am I doing this?” With issues that concern the land, one answer is the chthonic imperative, the calling of the Earth itself, working through the chambers of an ecology of the imagination. That is the field, the grounding, of shamanic awareness. White opens the said essay by telling how, at one point during a symposium on Burns, Beuys and Beyond – the figure of the artist in (modern) society, he was asked for the title of his impending lecture. He says that the shamanic imagery “leaped in to my mind with all the inevitability of dictation from the subconscious.” That, he concedes, “is another way of saying that my title may sound a bit surrealistic. I didn’t understand it very well at first myself, but, as I worked away, I came to understand it more.”14 Such are the dynamics of shamanism; here, the antithesis of plans of action, performance indicators and managed outcomes. Such shamanic stravaiging is of the essence of art. Issues such as land reform, superquarries or motorway protests become the stages of much wider dramas, a deeper and more basic call to consciousness of what is human, and to that in nature which is not-just-human . 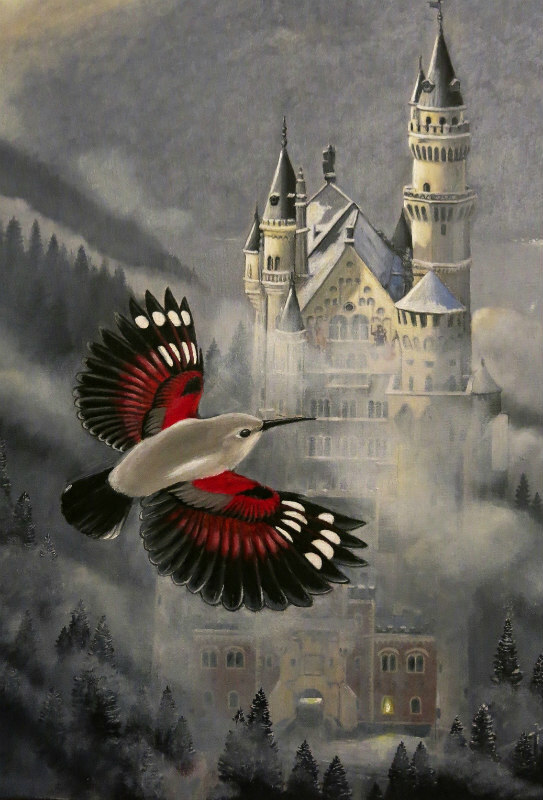 As such, the shamanic function is to “stimulate and feed the imagination, demolish the barriers between dream and present reality [and] open windows upon worlds inhabited by the gods, the dead and the spirits.”15 The American mythologist Joseph Campbell arrived at the same conclusion through his study of the heroic archetype. “The effect of the successful adventure of the hero,” he concluded, “is the unlocking and release again of the flow of life into the body of the world.”16 That is what distinguishes shamanic art, sacred art, from narcissistic forms of self-expression. How far is White aware that his work might answer to this function? I can imagine him smiling, shyly, with slight embarrassment at the suggestion. I can imagine his unease at my emphasis here on “the spirit”, and at my crediting his work with having a political impact. In other ways, I suspect that our “dewar” is very aware of these things. Everyone who walks between the worlds feels the tension between what is safe in being rarefied, and what can have a power upon the material plane that can be frightening in the responsibility that it carries. Think of the slow, deliberative, swings of energy from one foot to the other in the piper’s gait when playing pibroch. Think of the gaze of onlookers from the dress circle – bemused, puzzled, discombobulated – as evening dawns the dreaming of the call of great migrations. They can stone the prophets, you know, as well as cheer them on. which is absent from so much of Western poetry … but which is forever present in the poetry of the East. ‘The ultimate excellence of poetry’, writes Yen Yu (China, thirteenth century) ‘consists in one thing: entering the spirit. If poetry can succeed in doing this, it will have reached the limit and cannot be surpassed.’ To enter the spirit is to enter the world (the ‘real life’, the absence of which Rimbaud was to decry in the West.) We are badly in need of poetry that ‘has a world’. “I am suggesting that we try and get back an earth-sense, a ground sense, and a freshness of the world such as those men, those Finn-men, knew when they moved over an earth from which the ice had just recently receded. In that line we hear the piper stepping at the gates. A paradox of White is that Precentor Seagull’s very act of precenting seems at odds with his “professed atheism”; an atheism, observes Jamet, that “still remains dialectically attached to what he professes to have emerged from long ago” of his Presbyterian upbringing.17 That paradox for White, like with some of the Gaelic poets of the 20th century, must perhaps remain unresolved. However, a generation or two further down the line a way has cleared that lets the sun climb higher in the sky. To be a nomad is one thing. To return as prodigals from the wandering is another; yet that is what is happening when the younger generations of today reconnect, as they are able to do, with lands from which their forbears had been alienated. In her lyrics we find no reticence of celebration of the mountain goddess. Here, from Eigg “the Island of the Big Women”, the spiritual feminine is freed of self-conscious reticence. what will we leave, when we leave? What will we leave, when we leave? …. “This Trust offers the prospect that when a future visitor asks your children who owns Eigg, they will reply, not a German factory magnate, English pop star, Swiss banker, Saudi oil sheik, Dutch syndicate, aristocratic heir, racing car driver, insurance company or any other sort of “laird”, but simply, “Us … held in trust for people and nature”. I ask my question, one last time. I ask it in honour of the work of Kenneth Dewar White, and in honour of all those who have aided the study and practice of geopoetics. Who said “you can’t eat poetry”? 1 Kenneth White, Open World: The Collected Poems 1960-2000, Polygon, Edinburgh, 2003, p. 47. 2 Full discussion and references in Soil and Soul: People versus Corporate Power, Aurum Press, 2001, chapter 6. 3 We misquoted “skull” as “mind”, and that misquote has subsequently been replicated many times elsewhere. Apologies, Ken. It was Liz’s artistic eye that found the poem, and I’ve often wondered if she might have given it a subtle tweak to tone down the elemental rawness. The original is in White’s Open World, ibid., p. 99. 5 “Walking the Coast” in Kenneth White, The Bird Path, Penguin/Mainstream, London/Edinburgh, p. 42. I have also used this poem in the exploration of “meaning” in the theory of social science research, see the second of my chapter contributions to Radical Human Ecology (Ashgate/Routledge), Farnham, 2012, p. 253; online at http://www.alastairmcintosh.com/articles/2012-Radical-Human-Ecology-McIntosh.pdf. I see this as a paradigmatic stanza of poetry, one that could be seen partly as an outcome of postmodern fluidity of thought, but also as a restraint upon it, even a rebuke to soulless deconstruction; a calling to a higher and Zen-like sense of the ordering of reality. I first encountered the quoted stanza in a publication of Scottish Churches’ Action for World Development, thus providing a nod towards the tangential religious impact of White’s work. 7 Kenneth White, “Elements of Geopoetics,” Edinburgh Review, 88, Summer 1992, pp. 163-178. 8 Jamie Whittle, White River: a Journey up and down the River Findhorn, Sandstone Press, Highland Scotland, 2007, pp. 144-145. 9 Primarily, in Soil and Soul where the superquarry saga runs in parallel with that of Eigg and the searching issues of our times. 10 Allen Ginsberg, Howl, City Lights Books, San Francisco, 1956, p. 21. 11 Pierre Jamet, “Kenneth White and Religion” in Grounding a World: Essays on the work of Kenneth White, ed. Gavin Bowd, Charles Forsdick & Norman Bissell, Alba Editions, Glasgow, 2005, pp. 96-108. 12 Pers. com. 12 Sept. 2017. According to MacLennan’s Gaelic Dictionary, it can also mean a destitute person, which can be fitting to the artistic predicament. I should love to see some suitably qualified student make a study of Gaelic spiritual terms, and in particular, to gather what might still be out there in the old religious folks, before it disappears into the sphinx of “Gaelic with business studies”. 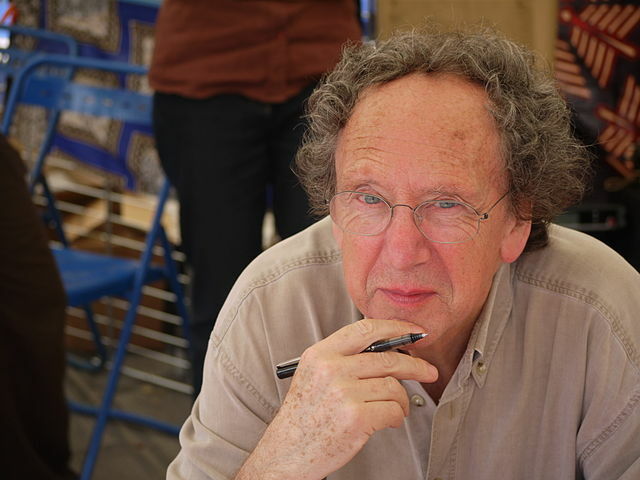 13 “Intellectual Nomad,” Cairns Craig, Scottish Review of Books, 28 June 2013, https://www.scottishreviewofbooks.org/2013/06/intellectual-nomad/. 14 Kenneth White, On Scottish Ground: Selected Essays, Polygon, Edinburgh, 1998. The essays I refer to here are “A Shaman Dancing on the Glacier”, pp. 35-48, originally published in Artwork, June-July 1991; “The Archaic Context”, pp. 15-34, originally written in 1967 and first published in La Figure du dehors, Editions Grasset, Paris, 1982; “Into the White World”, pp. 58-67, originally written 1966, first published in Raster VI/I, Amsterdam, 1972; and “The High Field”, pp. 165-180, originally written in 1975, first published as “Taking off from Hugh MacDiarmid” in Scottish Literary Journal, Vol 17:1, May 1990. 15 Mircea Eliade, Shamanism: Archaic Techniques of Ecstasy, Arkana, London, 1989, pp. 508-511. 16 Joseph Campbell, The Hero With a Thousand Faces, Fontana, London, 1993, p. 40. 17 Jamet, ibid.. In the traditions of the Highland church, according to John MacInnes, the role of precentors developed in part out of bardic tradition (pers com, c. 1996). 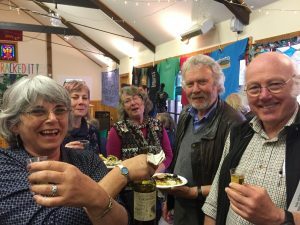 18 Miller, Phil, “Eigg’s historic community buyout to be celebrated in Celtic Connections 2018 25th anniversary festival”, The Herald, https://goo.gl/wh3P9i, 25 October 2017. 19 Songs of Separation, Proper Music Publishing, Navigator 094, www.songsofseparation.co.uk, 2016. Addendum: Kenneth’s email of 27 March 2018 (see note 3) took issue with my metaphor in this section of Moses and the Promised land. It does so in a manner with which I am, to a considerable extent, happy to stand corrected. Specifically so, on the presumption that he means “genius” not in its colloquial sense of celebrity or IQ, but in its etymologically correct sense of a generative, procreative or tutelary guiding “spirit”. He wrote: “End of 2017, after reading your fine essay … I started scribbling a cluster of notes under the title: “A Pointer or Two for Alastair – maybe for future use.” But I got interrupted and pulled away from this embryo of text because of an oncoming avalanche of work from up the mountain. Glancing though those scattered notes, some hardly legible, I see I wanted to take you up especially on a paragraph near the end of your essay where you speak of one generation glimpsing the Promised Land and the task of another to “take the final step”. Here’s the note: ‘It’s never a question of generation, but of genius. Native genius and nomadic genius. And of the work of large minds, scattered across time and space, often done in margins that can include exile. Apprehension of such work can be partial, minimal, even non-existent. But if there’s going to be any real moving ahead, sight should never be lost of the original field, with all its energy, co-ordinates and precision.’ You make of that what you want.” What I make of it, is that to move in the deep “carrying stream” of a culture entails looking not just to where the river is flowing, but raising one’s eyes to the mountains from whence it rose. “Genius” is cognate with Genesis, with beginnings. We must not forget our roots, our lineage, the ancestors, in our concern for nurturing the children’s future. Like when pulling at the oars, we row forwards while looking backwards. 20 Eigg Trust Launch Address, The Edinburgh Review, Edinburgh University Press, No. 88, 1992, pp. 158-162. 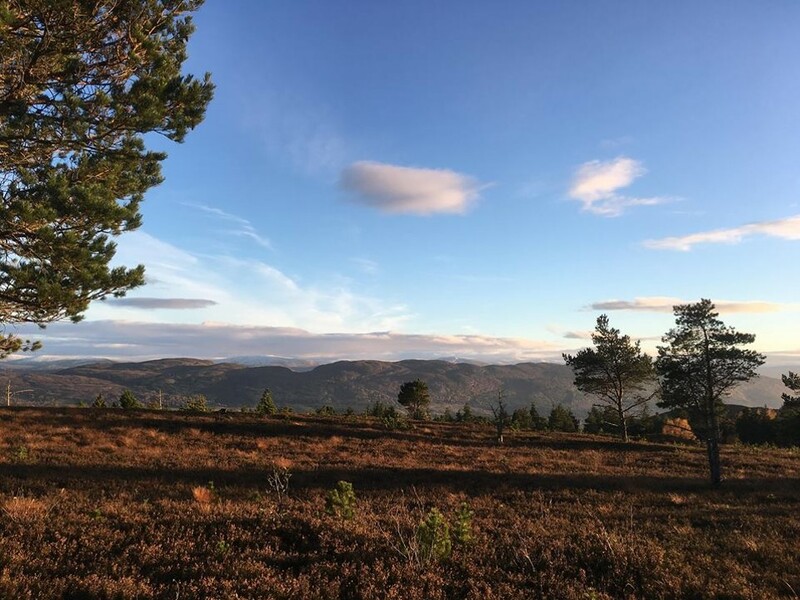 A warm welcome to all the new members who have joined the Scottish Centre for Geopoetics since June’s Expressing the Earth Conference in Argyll, and to all the new subscribers to this newsletter. A special welcome to new members in Australia and Ireland. The conference was a watershed event in the development of geopoetics and we have decided to follow it with a Geopoetics Day and an annual Tony McManus Geopoetics Lecture to be held after our AGM on Saturday 18th November. The inaugural lecture will be on Nan Shepherd as Geopoet and will be given by our Chairperson James McCarthy. James McCarthy is a writer based in Edinburgh, the author of 11 published books, currently focussed on historic Scottish travellers and explorers, in addition to articles in other publications. He is a former forester and leading conservationist who has travelled extensively in East Africa, USA, Canada, Australia and Europe. He is an engaging speaker who has presented his work at the leading book festivals in Scotland. Free entry; donations welcome. You can attend for all or part of the day. Please email Norman Bissell if you are having lunch so we can let The Bridge Inn know numbers – lunch booking is essential. Standard menu can be found here. 7pm until late – informal ceilidh in Edinburgh (venue to be confirmed). Come all ye and bring your songs and poems. Mairi Campbell takes her acclaimed one woman show Pulse to Paisley, Stirling, Aberdeen and Cromarty from 5 – 14 October 2017. Follow her journey of discovery in her music and life from London to Mexico, Cape Breton to Lismore. Somhairle MacDonald is an artist, photographer and musician from the Scottish Highlands. His recent work inspired by the landscapes of Lochaber will be on display at The Ceilidh Place, Ullapool from 16 October – 4 January. Karine Polwart returns with her hit show Wind Resistance to the Royal Lyceum Theatre in Edinburgh from 3 – 11 November 2017. 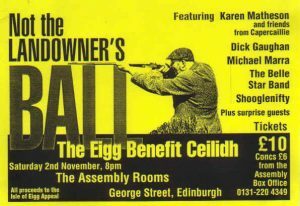 A compelling combination of story and song set at Fala Flow, south-east of Edinburgh. A new book from Kenneth White is now available from Aberdeen University Press. Collected Works, Volume 1: Underground to Otherground contains 3 early books, Incandescent Limbo, Letters from Gourgounel and Travels in the Drifting Dawn. Read more. There are also some of his essays available in English here. An appreciation of his work and a retracing of his Blue Road journey to Labrador can be read here. More information can be found on his personal website here. 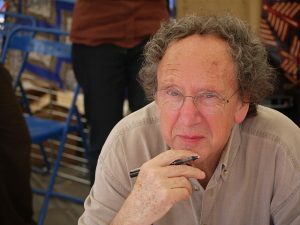 Please send information about geopoetics related publications, news and events for future newsletters to Norman Bissell. The keynote talks by Michael Russell and Norman Bissell at the Expressing the Earth Conference are available to read on our website www.geopoetics.org.uk. 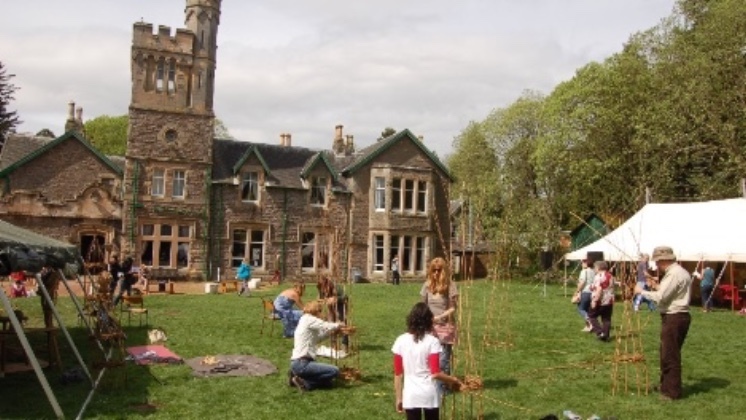 The Scottish Centre for Geopoetics is a membership organisation which relies on members’ subscriptions to fund its activities which are carried out by volunteers. Its purpose is to raise awareness of geopoetics as a crucial way to approach and respond creatively to the natural world of which we are part. Its network of individuals includes visual artists, writers, musicians, ornithologists, geologists, botanists, teachers and lecturers who all share a common interest in developing an understanding of geopoetics and applying it creatively in their lives. Membership for the year is £10 waged / £5 unwaged. Thank you! Please feel free to circulate this newsletter to friends who may be interested. It’s only 5 weeks until our biggest ever trans-disciplinary Geopoetics Conference in Argyll with a wide range of creative workshops, presentations, field visits, films, network sessions and performances. The Scottish Centre for Geopoetics and the University of the Highlands and Islands are hosting Expressing the Earth in Argyll 2017 to bring together creative artists, musicians, poets and film makers along with local people, academics, researchers, students and teachers to explore, create and debate the earth and the environment in this spectacular area of Scotland. We’ve had a great response to our Call for Engagement and, as you’ll see from the draft programme on our website home page www.geopoetics.org.uk, we have about 50 contributors to the event from different parts of Scotland, England, Switzerland and USA. It promises to be a very stimulating and inspiring event which should lead to lots of new creative work for possible inclusion in Stravaig. Themes and activities include literature, history, visual arts, film making, archaeology, geology, geography and theology – with active engagement and creative outcomes as central to the conference as academic papers and presentations. Speakers include Michael Russell MSP, Neil Simco (UHI), Mairead Nic Craith, Norman Bissell, Anna-Wendy Stevenson, Kenny Taylor, Elizabeth Rimmer and Alastair McIntosh. Workshops are from Mandy Haggith, Andrew Phillips, Helen Boden, Julie Ann Thomason, Susanne Olbrich, Mairi McFadyen and Susannah Rosenfeld-King. Performances include Mark Sheridan, Helen Moore, Finlay Wells. Aerial image by Birgit Whitmore of Ellenabeich with Seil Island Hall next to the largest quarry pool on the right. The Conference will take place at the Seil Island Hall in Argyll with field visits to create new work on Friday 23 and Saturday 24 June to Kilmartin Glen, Easdale Island and the Isle of Luing. There will be poetry readings, musical performances and social gatherings on the Thursday and Friday evenings. Cost £120 for 3 days, £45 per day, £5 for Friday night ceilidh only. The 3 day cost of £120 includes all sessions, 3 lunches, 2 evening meals and 2 ceilidhs, all teas/coffees and return transport to Isle of Luing, Easdale Island and Kilmartin Glen (and Kilmartin Museum entry). Places are limited, so please send a cheque made out to the Scottish Centre for Geopoetics ASAP to Dave Francis 214 Portobello High Street Edinburgh EH15 2AU to avoid Eventbrite transaction deductions, or book here: http://bit.ly/2nOUyng. It really is an event that’s not to be missed, and your support and input at it would be greatly appreciated. Hoping to hear from you soon.Free Wifi available in the hall. All participants will receive a free copy of Grounding a World: Essays on the Work of Kenneth White, Alba Editions rrp £9.95. Participants with relevant books to sell at the Geopoetics bookstall in the Hall should contact us in advance. Camping & Camper vans: Highland Arts, Ellenabeich : 01852 300273. I may also be able to advise you about accommodation if you can’t find any using the online links. The latest issue of our online journal Stravaig is still available to read here: http://bit.ly/2hWgzdI. There are essays from Jane Verburg and Antonia Thomas, the first and second place prize winners in the Hugh Miller Writing Competition, + James McCarthy on Nan Shepherd, Lisa Macdonald on the Coigach Conundrum and Bill Eddie on an Encounter with a Wall Creeper. There are also poems by Lisa Macdonald, David Francis, LesleyMay Miller, Mike Roman, Clare Diprose and Helen Moore. Twice yearly Newsletters by e-mail. Advance news of and discounts on books relating to geopoetics. Advance news of Kenneth White and geopoetics events. Invitations to all our meetings and field visits. The satisfaction of assisting the development of our geopoetics work and publications. Encouragement to develop your own understanding of and creative response to geopoetics. Please send this completed form with a cheque for £10 waged/£5 unwaged, payable to the Scottish Centre for Geopoetics, to David Francis, 214 Portobello High Street Edinburgh EH15 2AU. Please circulate this Newsletter to friends who may be interested. Thank you. You are cordially invited to take part in a trans-disciplinary Conference with creative workshops, presentations, field visits, films, seminars and performances. ‘Geopoetics is concerned, fundamentally, with a relationship to the earth and the opening of a world’. Expressing the Earth will address the ways in which people are influenced and brought together by island and rural environments from the Neolithic and Bronze Age, early Celtic Christian heritage and seafaring history to more recent industrial exploitation of the Slate Islands. Themes and activities include literature, history, visual arts, film making, archaeology, geology, geography and theology – with active engagement and creative outcomes as central to the conference as academic papers and presentations. Speakers include Michael Russell MSP, Neil Simco (UHI), Mairead Nic Craith, Norman Bissell, Mairi McFadyen, Kenny Taylor, Elizabeth Rimmer. Workshops include Mandy Haggith, Andrew Phillips, Helen Boden. Performances include Mark Sheridan, Helen Moore, Finlay Wells. The Conference will take place at the Seil Island Hall in Argyll with field visits to create new work on Friday 23 and Saturday 24 June to Kilmartin Glen, Easdale Island and the Isle of Luing. There will be poetry readings, musical performances and social gatherings on the Thursday and Friday evenings. It is intended that the work created by the conference will feature in publications, travelling exhibitions and workshops in 2018. Cost £120 for 3 days, £45 per day. Places are limited, so book early at Eventbrite here: http://bit.ly/ExpressingEarth. First preference will be given to those who can attend all 3 days. The 3 day cost includes all sessions, 3 lunches, 2 evening meals and 2 ceilidhs, all teas/coffees and return transport to Isle of Luing, Easdale Island and Kilmartin Glen (and Kilmartin Museum entry). Free Wifi available in the hall. Many thanks to all the contributors and to Bill Taylor who designed the new look Stravaig. Your feedback on its content and form would be most welcome. This conference is part of the Royal Society of Edinburgh Research Network in the Arts and Humanities ‘Connecting with a Low-carbon Scotland’, and is hosted by the University of Stirling Centre for Environment, Heritage and Policy. It includes panels for literature and theatre, law and politics, visual arts and media, and history and philosophy. 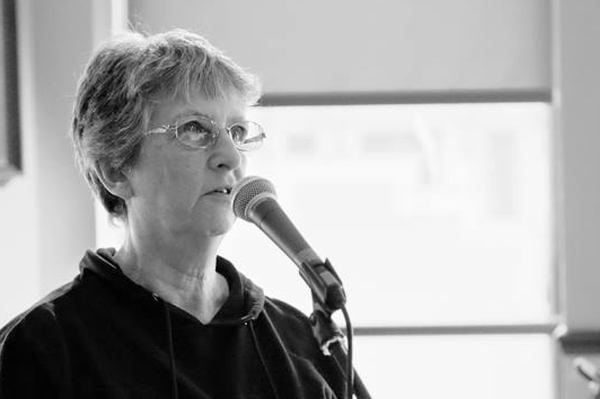 Poet and Scottish Centre for Geopoetics Council member Elizabeth Rimmer will be speaking at the conference. A free copy of Grounding a World; Essays on the Work of Kenneth White: ed. G Bowd, C Forsdick & N Bissell rrp £9.95. 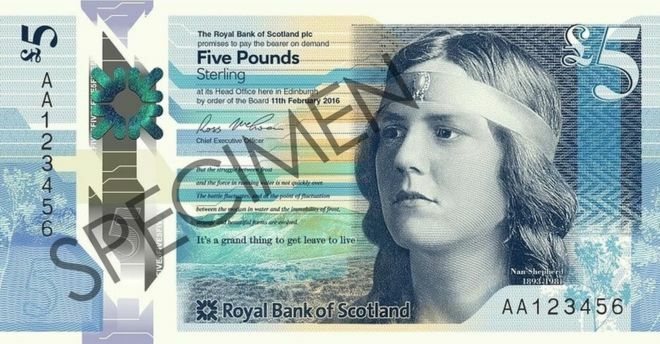 Please send this completed form with a cheque for £10 waged/£5 unwaged, payable to the Scottish Centre for Geopoetics, to David Francis, 214 Portobello High Street Edinburgh EH15 2AU or to arrange to make a bank transfer tel. 07825 788861.